In general, Bitcoin and Ethereum are the currencies with the highest trading volume in the market. Most of the times, Bitcoin takes the lead. But on July the 28th, Ethereum registered a spike in volume of around $12 billion dollars. How was that possible? A new virtual currency exchange known as EXX appeared in the market with a big surprise for traders: Ethereum registered a $12 billion dollars trading volume. This is a very strange situation due to the fact that Bitcoin has a daily trading volume of $4 billion dollars. It is interesting to see that most of the volume comes from the Tether (USDT) trading pair. This is the first time since spring 2017 that Ethereum has a higher trading volume than BTC. But why Ethereum and exactly with the USDT pair? This situation seems to be generated by a new method to make transactions free known as transaction mining. Each transaction made is able to create a token, like the EXX token. These tokens are being created by transactions processed at the exchange. Every single time there is a transaction new EXX tokens are created allowing individuals to make free trades or even earn some money. Users at the EXX exchange are trading at all times in order to profit from this new method of mining virtual currencies that became famous some time ago. In the future, it may be very profitable to sell the EXX tokens if there is a change in the regulatory environment in the Asian country. 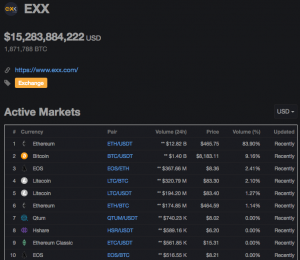 The EXX exchange is now registering a total volume of $15.2 billion dollars compared to Binance – one of the most important virtual currency exchanges in the market – with $1.07 billion dollars transacted in the last 24 hours. Ethereum is currently being traded around $465 dollars and has a market capitalization of $47 billion dollars. The currencies with the highest trading volume, excluding Ethereum are Bitcoin (BTC) with $4 bln, Tether (USDT) with $2.48 bln, Bitcoin Cash (BCH) with $539 mln, EOS with $523 mln and Litecoin (LTC) with $306 mln.